"Office 2019 for Mac ... is set to ship alongside Office 2019 for Windows in the second half of 2018.," wrote Jared Spataro, the Microsoft executive in charge of Office's product marketing, in a June 12 post to a company blog. The vague release window of "second half of 2018" is as granular as Microsoft will get at this point. Office 365 subscribers have no reason to bother beta testing Office 2019 on Mac or Windows in any case: They've already seen what it will offer. The perpetually-licensed Office 2019 will be built from the changes that have accumulated in Office 365's core, Office 365 ProPlus, over the last three years. But for those still running Office for Mac sans a 365 sub, the beta will sport new tools and functionality, including customizable top-of-the-window "ribbons," email delivery scheduling and Excel funnel charts. The process of registering for the Office 2019 for Mac beta is identical to the steps Windows users took to get their preview. This Computerworld piece from April spelled out the steps; they apply for the Mac beta, too. 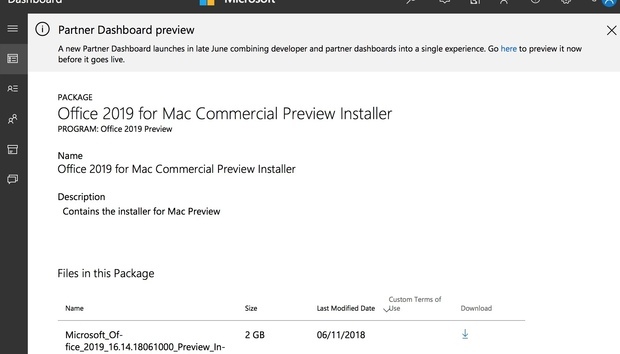 The 2GB-sized preview installer and associated documentation for the bundle - Word, Excel, PowerPoint, Outlook and OneNote - can be downloaded from the Microsoft Collaborate portal. According to information elsewhere, Office 2019 for Mac, including the preview, will be supported on the "two most recent versions of macOS" at any point in time. That means the beta of Office 2019 for Mac will be supported with security patches and other bug fixes on macOS 10.13 (High Sierra) and 10.12 (Sierra). If the production-grade version of the suite ships after Apple has refreshed macOS this fall, Office 2019 for Mac will be supported on macOS 10.14 (Mojave) and 10.13 (High Sierra). "For the best experience, use the latest version of any operating system," Microsoft urged.